Excellent proportions, highly original and with a very good history. 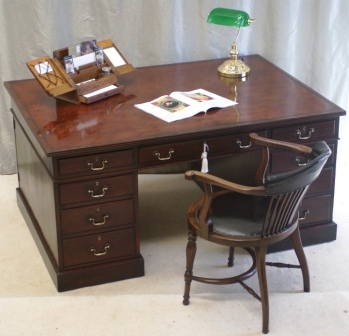 A fine quality Large Antique Victorian Mahogany Partners Desk. The front elevation comprises nine drawers of graduated size. The rear elevation has two large cupboards each with a (removable) shelf and three frieze drawers. Original brass handles, locks, escutcheons, keys, castors and wheels. Original chestnut one piece leather writing surface. hand embossed and in superb condition (just re-waxed). Crossbanded top with moulded edges. Three piece construction for ease of transport.